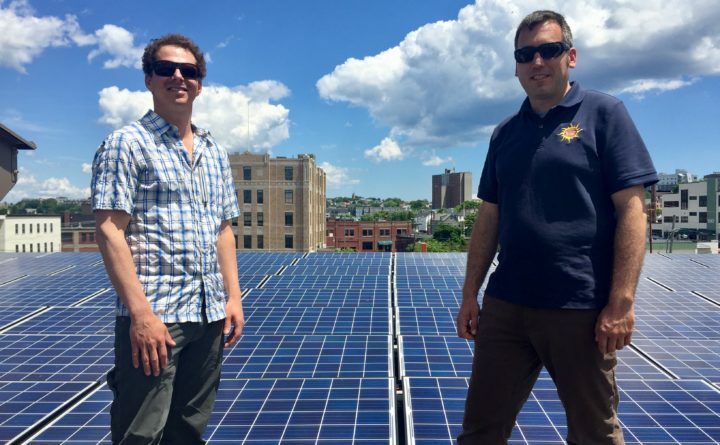 Bayside Bowl co-owner Justin Alfond, left, and Revision Energy's Josh Baston stand on the new roof amid the entertainment emporium's impressive solar array in this June 21, 2017, file photo. ReVision Energy, a Liberty-based solar energy company that has grown during the past 15 years to include more than 250 employees in Maine, New Hampshire and Massachusetts, is gearing up for further growth. On Monday, ReVision officials announced it will merge with Energy Emporium of Enfield, New Hampshire. That company, which was founded in 2009, has a mission to help people reduce or eliminate fossil fuel use and is housed in a zero-energy building renovated from a historic 1850s-era shell, according a Monday release from ReVision Energy. The merger is intended to position ReVision for further growth in the Upper Valley, a region that includes New Hampshire and Vermont towns located along a 40-mile or so stretch of the Connecticut River. Last year, the Maine-based company completed a number of solar projects in the Upper Valley, including several for Dartmouth College in Hanover, New Hampshire. “ReVision’s mission is to transition our region to 100% solar and solar-powered complementary technologies, and the Upper Valley is critical to that effort,” Dan Clapp, ReVision Energy co-founder and general manager of New Hampshire operations, said in the press release. Energy Emporium’s New Hampshire location will remain open, officials said, and its founder and a longtime team member both will become ReVision Energy employee-owners. The Maine-based company has locations in Liberty and Portland, as well as Exeter, New Hampshire; Concord, New Hampshire; and North Andover, Massachusetts. Its crews have installed more than 8,000 solar energy systems.